Dion Phaneuf scored twice and Devan Dubnyk stopped all 22 shots he faced Saturday as Canada cruised to a comfortable 8-0 victory over Kazakhstan at the IIHF world hockey championships. 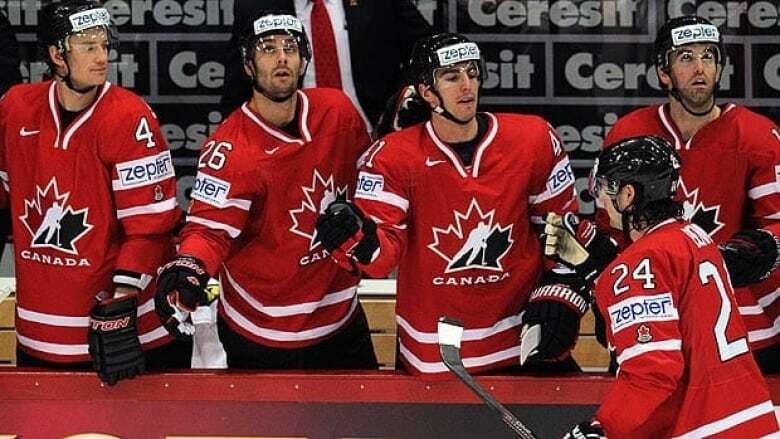 Canada is exactly where it needs to be at the IIHF World Hockey Championship. Not only does the team control its own destiny on the Helsinki side of the tournament, it also appears to be rounding into form heading into the pressure packed final week. An 8-0 victory over Kazakhstan on Saturday may not have held much suspense, but it did offer evidence that Canada is headed in the right direction — particularly since it came just 24 hours after an emotional victory over the host Finns. "We did a real good job of making sure our focus was where it needed to be today," said Canadian coach Brent Sutter. "We played a real solid 60 minutes and it's a tremendous credit to the players that they handled it the right way." Devan Dubnyk stopped all 24 shots he faced while Dion Phaneuf scored twice as Canada spread its offence around. Kazakhstan arrived at this tournament looking to earn respect from the top hockey nations and managed to take the Americans to overtime on Friday before losing 3-2. They also started well against Canada, keeping the score to 1-0 through the first 30 minutes. "It was a tight game early," said Phaneuf. "They came out hard. We respected them as an opponent — I think any team in this tournament has proven it can win on any given night." The Kazaks saw their slim chance at an upset disappear because Canada stuck to its game plan and eventually wore them out. It was a patient performance by the Canadians, who broke their opponent's will with an aggressive and disciplined game. "We fell like rocks down a hill," said Kazak forward Konstantin Pushkarev. "It looks like we were gassed and we've got no emotions. It was a pretty bad game for us. Corey Perry, Alex Burrows, Evander Kane, John Tavares, Teddy Purcell and Ryan Nugent-Hopkins also scored on a night where all but five players recorded at least one point for Canada (5-0-1). Duncan Keith and Ryan Getzlaf each added three assists. Kazakhstan faced Canada for the first time ever in world championship play and saw its record drop to 0-5-1. The team will be relegated to the lower level Group A world championship next year. Canada, meanwhile, can clinch the top seed in the Helsinki pool with a victory in its final round robin game against Belarus on Tuesday. After that, it will need three straight victories to claim the country's first world championship gold since 2007. "We're playing the way that we want to play," said Phaneuf. Canada should take some confidence away from the fact it didn't suffer a major letdown after the big comeback win over Finland. That game was played in front of a rocking sold out crowd at Hartwall Arena — a far cry from the library-like atmosphere with just 4,151 people in the building Saturday. The goals didn't come quickly. Kazakhstan killed a penalty in the first period and managed to keep Canada off the scoresheet for 15 minutes. Phaneuf eventually got things started on his team's second man advantage with a hard slapshot that beat Vitali Kolesnik at 15:45 to make it 1-0. However, the Kazaks didn't go away — testing Dubnyk with 10 shots in the second period. Roman Savchenko had a glorious chance to tie the game with the Canadian goalie down and out, but he fired high with the team's best scoring chance of the night. "It was still fresh ice," said Dubnyk. "As I went down, I slid a bit to my right more than I would have liked. It just went off my pad and right to their guy. Lucky for me he chopped it over [the net]." Perry gave Canada a little breathing room with a nice wraparound goal at 12:05 before Jordan Eberle earned an assist the hard way. He was knocked to the ice by Vladislav Kolesnikov, who had just come out of the penalty box, but had the puck go right to Burrows for a goal at 17:03. Eberle wasn't shaken up on the play. "He just clipped me," he said. The game turned into a rout in the final 20 minutes. Early goals 50 seconds apart by Kane, Tavares and Purcell chased Kolesnik from the net before Phaneuf got his second goal of the night at 5:53 against backup Vitali Yeremeyev. "We wanted to try and wear them down and try and wear their belief down," said Tavares. "I think over the course of the game we did that. Eventually, we got the results that we wanted." Dubnyk earned his first career world championship shutout. He had to stand tall during a late 5-on-3 disadvantage that prompted Kazakhstan to call a timeout in the final minute to draw up a play. There were smiles all around when the final buzzer sounded on a satisfying victory. It could have been a trap game against a weaker opponent but Canada played exactly as it intended to. "You want to just keep your good habits and stay as focused as you can," said Eberle. "Obviously, it can be tough. But you have to be prepared for the games ahead and all of that starts with good habits."